Pharm. 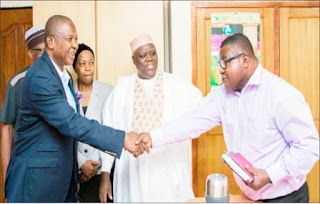 (Mazi) Sam Ohuabunwa, the new President of Pharmaceutical Society of Nigeria (PSN) in a hand shake with Pharm. Emeka Duru, PSN Secretary after the election of new national executives, while Pharm. Ahmed Yakasai, former president of the society and others watch in admiration. Pharm. (Mazi) Sam Ohuabunwa has emerged the new President of Pharmaceutical Society of Nigeria (PSN). The emergence of Mazi Ohuabunwa took place at the just concluded Annual National Conference of the Pharmaceutical Society of Nigeria (PSN) which held in Ibadan, after the election of new national executives. As the former president of the society, Pharm. Ahmed Yakasai took a bow at the conference; an election was conducted to replace him. Out of a total of 2,223 votes cast at the elections, Pharm. Mazi Ohuabunwa had 1,065 votes. Other contenders for the position included, Pharm. Obalolu Ojo, who had 386 votes; Pharm. Anthony Oyawole, with 498 votes; and Pharm. Daniel Otakho Orumwense with 271 votes. Giving his inaugural speech, the new president expressed his appreciation to God for the opportunity to serve. He also appreciated every member of the PSN for voting for him. Mazi Ohuabunwa also said that the election was a landmark for the Pharmaceutical Society of Nigeria – that has ushered in a new dawn to the pharmacy profession. He added that every pharmacist should be ready to work for them to achieve their vision of returning ‘the pharmacist’ to his sacrosanct position as the qualified dispenser of quality medicines. He stated that he will work with all stakeholders in the health sectors to ensure that sanity is restored to the healthcare system in Nigeria. He also called on all Nigerians to note that medicines are not to be taken without the supervision of the pharmacist. He assured the immediate past President, Pharm. Ahmed Yakasai and other past presidents that he would not fail them considering the work that they had put in thus far. The newly elected executives are: Pharm. Mazi Sam I. Ohuabunwa as President, Pharm. Munir Elelu as Deputy President North, Pharm. Foyibo Ejiro as Deputy President South, Pharm. Emeka Callistus Duru as General Secretary, Pharm. Odudu Samuel Akpaete as Assistant General Secretary, Pharm. Ijeoma Okey-Ewurum as Publicity Secretary, and Pharm. Adefolake Adeniyi as the Treasurer. Others include: Pharm. Chinyere Osakwe as the Financial Secretary, Pharm. Tosin Adeyemi as the Editor-in – Chief, while Pharm. Albert Kelong Alkali and Pharm. Udeora Egbuna were elected as unofficial Executives.